Philippine Wrestling Revolution (PWR) made its long awaited return to Makati last May 28, 2017 for PWR Live: Resbak at the Foton Showroom, located at Pasong Tamo Extension. 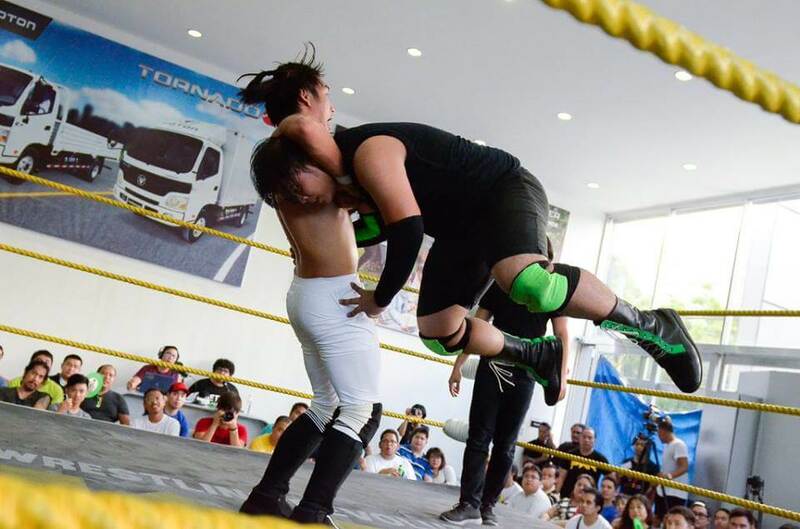 PWR Live: Resbak basically lit up the Foton Showroom with some hard-hitting wrestling action! The returning Vintend∅ took on the debuting Zayden Trudeau. The Fighting Gamer looked good in his return match, but Trudeau took the victory with an impressive move he called the “Desolé”. SANDATA made quick work of the debuting Kh3Ndrick. The “Kakaibro” was busy taking selfies with his groupies and it cost him after he got the “Ang Huling Bala” (running knee) from SANDATA. PWR Live: Resbak started off with the very first live edition of the R&C (Rich and Cool) Show with the YOLO Twins and their guest, Ken Warren. Warren said that the PHX Champion Chino Guinto was a Ken Warren fangirl and is not as good as him. Mr. Sy interrupted the show and booked the Twins in a tag team match against the Punk Dolls. Robynn has her submission locked in! Martivo caught both twins with a huge double clothesline to start the match. The Man Doll gave Logan a unique ‘twerk face’ on the corner. The YOLO Twins would seize control and isolate the Man Doll for most of the match, until he made the hot tag to Robynn. Ken Warren snuck in and clocked Robynn with one of the belts to give the YOLO Twins the pinfall victory over the Punk Dolls. The Twins and Ken Warren added insult to injury after the match as they hit Robynn with a triple superkick. Ken Warren took on the internationally known masked wrestler, Koto Hiro. Koto Hiro displayed his amazing arsenal on Ken Warren which included a springboard neckbreaker and the airplane spin. Hiro would also pull off an amazing frankensteiner on KW on the top turnbuckle. The numbers game would be too much for Koto Hiro and he lost the match after getting hit by Ken Warren’s Wi-Fi. Idol and ABII controlled most of the action as they double teamed Dan Ericson. Dan, with an enzugiri out of nowhere, made the hot tag to Dax Xaviera. Dax was on fire and took out ABIII outside with a splash. He locked Idol with a leglock until it was broken up by ABIII. Dan got back in the match to plant ABIII with a deep DDT, but Idol would grab him and hit the pay-in for the pinfall victory. PV with an impressive kick on Chino Guinto! The Golden Boy and P-to the-V put on a very exciting match in this PHX title bout. The former PHX Champion stomped a mudhole on the Golden Boy and hit him with an impressive spin kick. Guinto would fight back and took PV down with a ‘block buster’ from the top rope. Chino delivered a Fireman’s Carry Neckbreaker for a near 3 count on PV. PV avoided the Gold Digger stomp and took out Chino with a stomach breaker for a near fall. The end saw Chino Guinto rolling PV up for the 1-2-3 after he avoided the Karne Norte Stomachbreaker. Ken Warren and The YOLO Twins attacked the PHX Champion after the match. The trio left as once Idol and his Network downlines went ringside. AB III and the down lines helped Guinto up, but they delivered the PHX belt briefly to Idol. Chino would get his belt back and raised it as Idol looked on from the second floor. Check out the NEXT page for more PWR Live: Resbak Results! MUST WATCH: Young Stephen Curry and His Dad star in a 90’s Burger King Commercial! Sukigi Swim: Cute And Fashionable Swimwear For The Water Sports Babe!